The Kimberley Toad Buster volunteers are delighted by the announcement on Tuesday 28 th October 2008 from the Minister for the Environment, the Honourable Ms Donna Faragher, that the WA government would support the cane toad campaign of the Kimberley Toad Busters, which would include $1.2 million over four years. Photo: Indigenous Affairs Minister Kim Hames and Indigenous Affairs policy adviser for Dr Hames, Neville Collard, taking a quick break from cane toad busting with kids at the KTB cane toad busting camp on Tuesday October 28. Deputy Premier, Minister for Indigenous Affairs and Health, the Honourable Dr Kim Hames and the Minister for the Environment, the Honourable Ms Donna Faragher toadbusted on Tuesday 28 th October with the Kimberley Toad Busters at Duck Hole Bore on Auvergne Station. The Ministerial toadbust added 2,372 cane toads to the KTB adult toad tally. “While toad numbers are always an important milestone and one measure of success, cleaning out an area – whether it be the only breeding pair in a billabong or an entire population of 10,000 cane toads – is equally important at the front line, given that one mature female cane toad can lay up to 35,000 eggs twice a year,” says Katrina Nissen KTB’s “What’s In Your Backyard” biodiversity program coordinator. 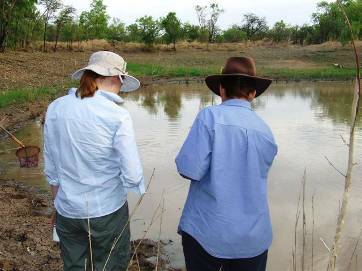 Photo from Dr Hames’ staff, with thanks, shows the Honourable Minister, Ms Donna Faragher discussing the finer points of cane toad tadpole and metamorph busting with KTB President and Volunteer, Ms Lee Scott-Virtue. Our hardy Ministers stayed the course by analysing and euthanasing their catch and then camping out with the KTBs. Derby born, Dr Hames was determined to record, measure and euthanase all the cane toads he had caught. This meant he did not hit his swag until around 2.00am. “If the Ministers are as hardy in our parliament as they were out toadbusting, the WA community will be well served by their public service”, said Lee Scott-Virtue, Volunteer KTB President and Field Coordinator, and long time toadbuster. Photo: With thanks to Dr Kim Hames’ staff. 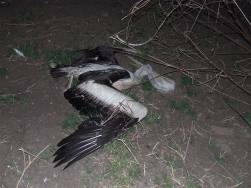 This dead pelican found on the Ministerial toadbust may have died from cane toad poison. “You often see a pelican fly/run along the top of water to stir up the food, with a flock following to gather up the bounty,” says Lee Scott-Virtue whose Kimberley remote area experience as a specialist rock art tour guide has led to a font of wonderful wildlife stories, and safe toadbusting rules. Pelicans eat native frogs. Heart stopping bufo-toxin, which is in cane toad eggs, early tadpoles and adults, is lethal to our wildlife. 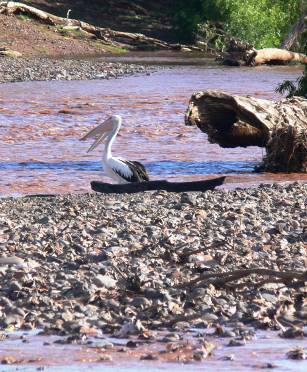 Photo: A pelican watching muddy red floodwaters pour over the Negri River Duncan Highway crossing, waiting for the fish exposed in the shallows. What happens when the toads arrive? “We are losing a lot of our NT native wildlife to cane toads on this colonising front. We just hope that we do not lose an entire species before it has learned to avoid cane toads,” says Del Collins long time cane toadbuster volunteer, and local Kununurra hospital cane toad team leader. 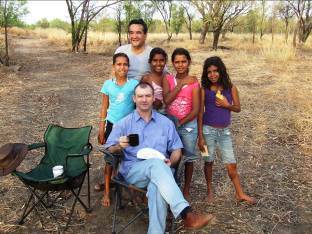 “As volunteers, we hatched the egg that is the Kimberley Toad Buster campaign. Together we made this egg multi-cultural, multi-lingual and multi-tasking. With this welcome funding, the Minister for the Environment has incubated the egg into a rapid hatching, from which it will flourish, and spread its wings over our cane toad campaign,” MaryAnne Winton, KTB aboriginal leader.